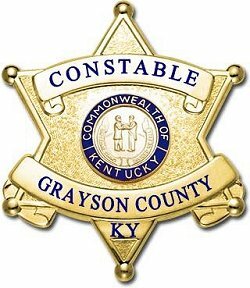 Official Dress-Uniform - KY Constable Association, Inc.
To provide a distinct identity to the association and its members. Uniforms show pride in your Association. The official dress colors are navy blue and tan. Official dress shall be navy blue uniform pants with tan stripe down each leg, tan uniform shirt with navy blue pocket flaps and navy blue epaulets on the shoulders along with shoulder patches denoting the county of the Constable’s Office. Other uniform insignia may consist of such gold items (to indicate rank as Constable) as Name plate, badge, proper collar pins, whistle chain, buttons and any other items deemed necessary. *Navy blue campaign hat with gold cord, acorns and state seal. *Navy blue tie for use with long sleeves uniform shirt. Our Association recommends wearing a six point star badge with the Kentucky State Seal similar to the one shown below.